If you’ve ever searched for a skin lightening cream, you’ve already heard of Meladerm. Meladerm is a topical, over-the-counter treatment for addressing skin issues related to the excess of melanin, the skin pigment. Since it first came out in 2003, it’s risen to become one of the most popular lightening and brightening creams on the market so there’s plenty of buzz surrounding it. At first glance, it looks super promising. But does it live up to the hype? Here’re 6 things you should know about the Meladerm cream before you buy! Do you know what’s the biggest skin lightening secret out there? What you put in is what you get out. It’s a no brainer. The efficacy of any product comes down largely to the ingredients it uses. It’s not the brand name; it’s not the heaps of positive reviews that makes a product effective in essence. It’s always going to be the ingredients. And the Meladerm cream plays a clean game in this regard. One of the best things about this skin lightening cream is that it doesn’t contain potentially harmful lightening ingredients like hydroquinone, steroids, and mercury. Instead, it combines a potent list of the best natural skin lighteners like kojic acid, mulberry root extract, bearberry leaf extract, licorice root extract, and alpha arbutin to produce safe skin lightening results. On top of natural lightening agents that suppress melanin production, Meladerm ingredients also boast a helpful group of exfoliants like lactic acid to help reveal the new, brighter and lighter skin more quickly. So, ingredients are definitely a big plus for Meladerm, but it’s certainly not unique in this. Several other stellar skin lightening products came out that effectively combine proven natural skin lightening agents. Let’s see what’s more in it. If you’re looking for a skin lightening cream for dark skin, you already know that the search can be tricky. Every skin type is different and when it comes to lightening ingredients, some are just not a good idea for darker skin. For example, a hydroquinone cream provides potent skin lightening results, especially at concentrations of 4% or higher, but while it’s safe for Caucasians and light-skinned Asians, it’s not safe for darker-skinned people. Lighter-skinned folks can use hydroquinone in 3-month cycles but for darker-skinned individuals, the continued use of hydroquinone can lead to ochronosis, which is a skin disorder that actually causes a sooty darkening of the skin! Completely counterproductive. That’s why potent natural skin lighteners are considered the best option for darker skin. And since Meladerm leaves out ingredients like hydroquinone and instead combines the most potent natural melanin suppressors – it’s perfectly safe for light and dark skinned people. On top of that, the Meladerm cream also contains no parabens, artificial fragrances or colors and no oil. The product description says that such a combination makes it suitable for sensitive skin and skin that’s prone to breakouts as well. Personally, though I prefer when a skincare product is formulated for a specific skin type. Having had sensitive, acne-prone skin, I’ve learned from my experience that creams work better when science was put into engineering a product for sensitive skin specifically. 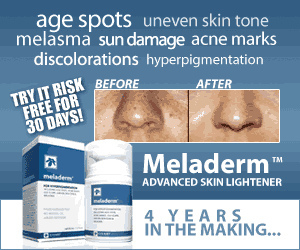 To sum it up, it’s an undeniable advantage of Meladerm that it’s suitable for people with different colored skin. Yet again, it’s not unsurpassed in this by other great products based on natural skin lightening agents only. Before buying a specific cream and assessing its effectiveness, you need to know what exactly are you trying to achieve. It’s even easy to confuse what all the different terms refer to, such as skin brightening, lightening or whitening. Understand what is your skin type, its ailments, and needs. If you are unsure about any of this, it’s good to consult a dermatologist. When it comes to uneven skin tone, for instance, there are two main types: hyperpigmentation and hypopigmentation. Hyperpigmentation is when patches of skin become darker in color than your normal skin. It’s caused by an excess of melanin, which forms deposits in the skin, causing those dreaded brown and black spots that happen on your face from sun damage and acne scars. Hypopigmentation, on the other hand, is the loss of skin color resulting in white spots on the skin. Since the skin lightening ingredients used in Meladerm work by suppressing melanin activity, the Meladerm cream is only effective for fading dark spots and lightening your overall complexion – not for darkening white spots. It’s easy to buy a product everyone is raving about and apply it on your face. If you’re the disciplined type, or if you’re highly motivated to see results (for example by the time of your best friend’s wedding) you’ll be good about consistent use and following usage instructions. But then the results won’t come. Checking the mirror and slanting the product website with bad reviews won’t help. First, make sure you know what you’re using. 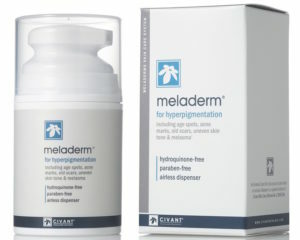 So use Meladerm for hyperpigmentation but not for hypopigmentation. There are always those people who are looking for faster-than-a-speeding-bullet solutions to their problems. While we understand this desire for quick results – it’s a fact that most things take time to work. When it comes to the quest for a bright complexion, besides simply genetics, uneven skin tone largely comes from the way we’ve treated our skin hitherto. I like the dentist metaphor. Imagine you’ve neglected to maintain dental hygiene over the course of your life. Then, one day you get a wake-up call and realize that your teeth aren’t bright enough. You run over to the dentist and ask for an overnight whitening solution. It’s pretty ridiculous, isn’t it? Science has worked hard to satisfy such demands, producing creams and medical procedures aimed at a fast transformation. For the most part, though, fast skin lightening options are either highly invasive to our body, or they contain harsh chemicals that harm your health in the short or long run. Lasting skin lightening results are bound to go in harmony with our body. And they take time to get there. This applies to pretty much every product out there and Meladerm is no exception. Sure, you’ll start seeing small changes in just a few weeks but it will take a good two to three months for a successful Meladerm before and after comparison. So be patient, apply regularly and you’ll get there soon enough. The slow, gradual diminishing of dark spots and hyperpigmentation is the only guarantee it will last in the long run. Meladerm cream is a fantastic daily treatment. It goes on smooth and nice – none of that sticky icky feeling – and it’s easy to layer moisturizer and sunscreen on top of it. Overall, it’s easy to get the hang of how to use Meladerm and to insert it into your regular skincare routine. But if you want faster (and lighter) results, there are ways to do so. Mainly, by combining other skin lightening methods along with Meladerm cream. One of the easiest options is to opt for a skin whitening soap. These contain lightening ingredients like kojic acid or glutathione to provide an extra boost of lightening power while you wash.
Another option is to take a skin lightening supplement. There are glutathione and Vitamin C combination pills that help whiten your skin from the inside out. The best part is that it won’t interfere with Meladerm cream at all – in fact, they work side by side to get you better results, faster. And while we’re at combining efforts, of course, the most important skin lightening tip: always, always wear sunscreen. Regular sunscreen application while using Meladerm or any other natural skin lightening cream is extremely important. Not only because it obviously cancels out the improvements you’re getting for a lightening cream. Even safe skin whitening creams make use of natural ingredients that cause photosensitivity. Make sure you never leave the house without sunscreen on. Take other preventive measures, like wearing a hat. Not only will protecting yourself from the sun prevent further tanning and dark spots, but it’ll also help you keep the lighter color that results from regular Meladerm use. At $50, Meladerm cream is pretty affordable as far as skin lightening creams go, but if you’re wary about opening your wallet for something that may not work for you, don’t worry. All Meladerm creams come with a 30-day money back guarantee so you can get your cash back to your pocket if you see no initial improvement. This means you have nothing to lose but those pesky dark spots! Before we close our review, it’s important to answer the question of side effects. Yes, there is a chance that you’ll experience side effects with Meladerm use. Based on independent clinical tests and what users have to say, Meladerm tends to cause redness, especially if it’s your first time using it and in the first days of application. Less often, it can cause subtle, but visible darkening of the skin in the first days of use. This is no cause for alarm though. It’s been found to disappear by itself after consistent use and it’s in no way a medical concern. Of course, like with any other product, allergies are always a possibility. Definitely run a trial application on a small patch of skin for three days, before you apply it all over your face or body. Only proceed with use if there was absolutely no reaction. If you’re unsure about the reaction you got, consult a dermatologist. A skin expert can help you determine your sensitivity to OCT products and advice you on whether to use them or not. Well, the good news is that there isn’t anything more to list here. The natural components of this formula seem to play a part in how few side effects it has. Ready to try Meladerm? It’s only available online – find it here!